Welcome to the official site of Kaizen Ryu Karate Do. 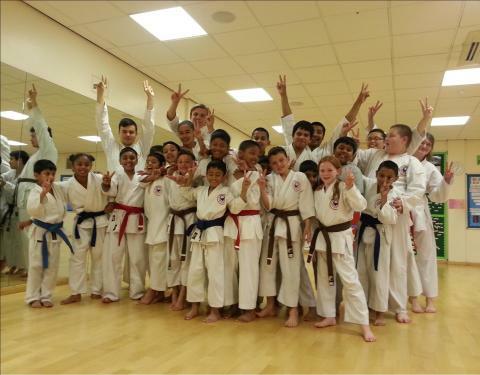 Kaizen Ryu Karate Do is a family friendly karate club with a number of dojo in the East London and Essex areas. Our aim is to make karate accessible to the general public whilst keeping the etiquette and traditions strong. We are a traditional club that draws kata and training methods from both the Goju and Shotokan schools. There is a strong emphasis on discipline and understanding of technique with the main focus of training being kihon (basic training) and kata, which lead instinctively to self defence training. We teach all ages from 5 years old, right up to 65. We offer children's classes for boys and girls under 13 and all ages classes geared toward adults and children who take their training even more seriously. Like all martial arts, there are a number of benefits that come with training at Kaizen Ryu Karate. These include improved fitness, a useful knowledge of self-defence, increased self-control and discipline, and self-respect. Kaizen Who? What's in the name? The word 'kaizen' itself means 'continuous improvement' and this forms the club's outlook. The senior instructors all train full time to make sure the skills they pass on are both current and to the best of their abilities. The students are nurtured from grade to grade and to build on the qualities inherent within many active sports and martial arts; confidence, self-discipline, and so on.